edit. Please visit my revised vegan food guide of Malacca here. 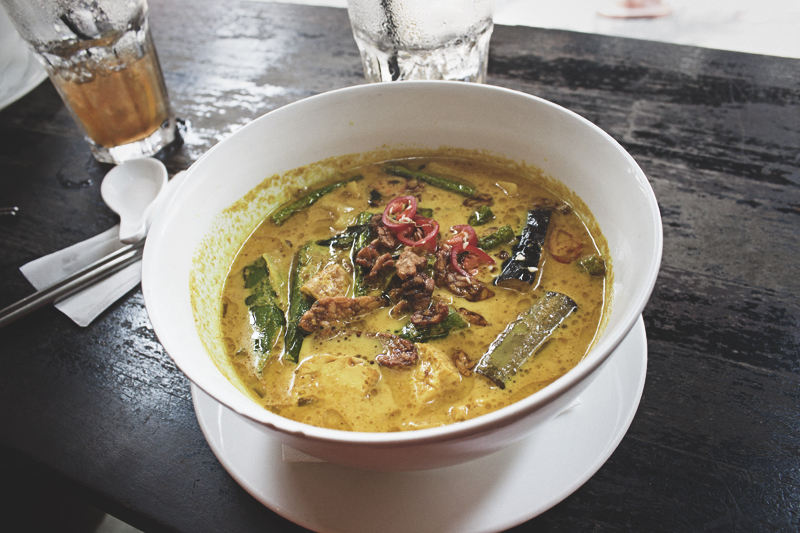 We returned to Malaysia with one goal in mind: eating all the laksa. Malacca was the only major city we had yet to visit in peninsular Malaysia and it fitted perfectly into our planned itinerary: we took a short flight from Bali to Singapore and hopped on a few buses that took us to Malacca with surprising ease, all within the same day. The plan from there on was to spend a few days on the west coast of Malaysia as we slowly made our ascent towards Southern Thailand. 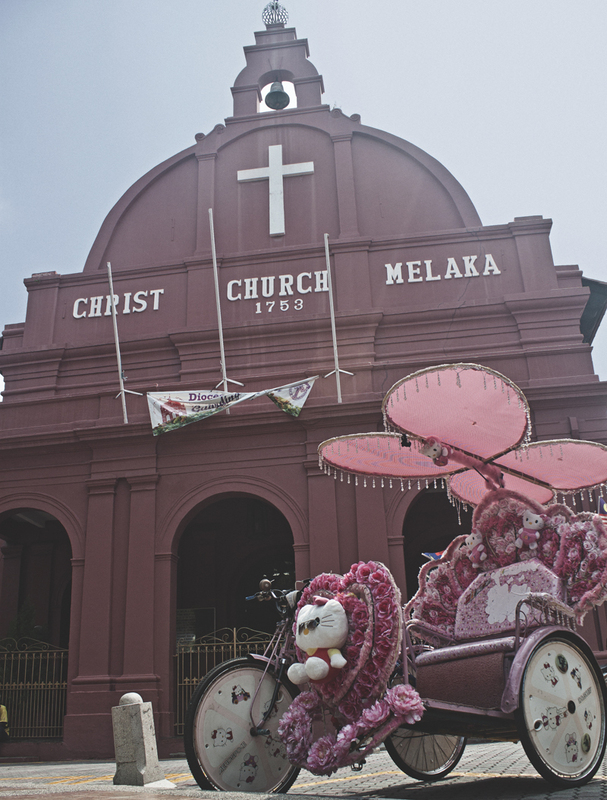 Malacca seemed like the perfect first stop to settle into our new slower pace of travelling (we both had a fair bit of work to do – this trip ain’t paying for itself!) as there isn’t an amazing lot to do. Don’t get me wrong, it’s a lovely city to settle into for a few days and we thoroughly enjoyed it. We stayed at the Old Town Guesthouse and it was the perfect place to relax, work, exercises and socialize – a little home away from home. This guesthouse truly is what backpackers’ dreams are made of. Shout out to the owner Chua who was possibly the most hospitable and generous host we’ve had in all of our travels. What there is a fair bit of in Malacca, however, is food. A lot of it can obviously be found at the famous Jonker Street night market, but unfortunately little in terms of savoury vegan options. We compiled a list of our favourite places for vegan grub in Malacca that I hope will be helpful. Very touristy restaurant in the heart of the most touristy street of Malacca. Expect annoyingly loud music and lots of Asian tourists taking photos of their food (and a few westerners too… hallo!) Lots of vegetarian and vegan options clearly marked on the menu (we like that all the ingredients are listed!) We ordered the longton (rice cubes, okra, cabbage, turmeric, lemongrass, tempeh) and the curry ramen (curry powder, rice noodles, cashew nuts, pine nuts, walnuts, almonds, sprouted long beans, eggplant, beancurd puff). Although both very mild in flavor, we really enjoyed our food. The broth of the ramen was actually made with nut milk, which is something a little different when you’ve been shovelling coconut curry for so long. I found the longton a little bland, but nothing a side order of sliced fresh birds eye chilies can’t fix. The broth was nice and creamy, and it was great to have something that is not laden with MSG for a change. We found the drinks to be quite expensive. Tourist prices. Why the accent on the Veggie? I do not know. Veggi-ay(!) 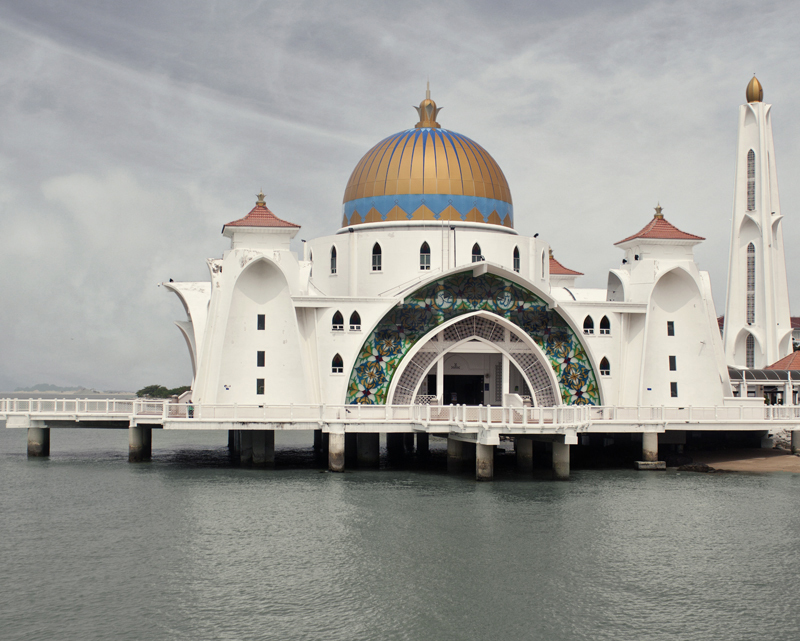 Planet is situated quite far from any touristy stuff, but we took advantage of our off-road walking adventure to the Malacca Straits Mosque to come and sample the food. There are a few big malls nearby, so it’s a good rest option if you’re out and about shopping. The restaurant interior is beautiful, especially the room to the right of the entrance – the open air kitchen reminded me of Chelsea Market in NYC. The menu is mostly Chinese-Malay with a few western items thrown in for good measure. There is no dairy, but several dishes contain egg – it’s clearly indicated however. The prices are cheap by western standards for such quality food, but the juices were really expensive. We had the nasi lemak and the energy rice porridge. 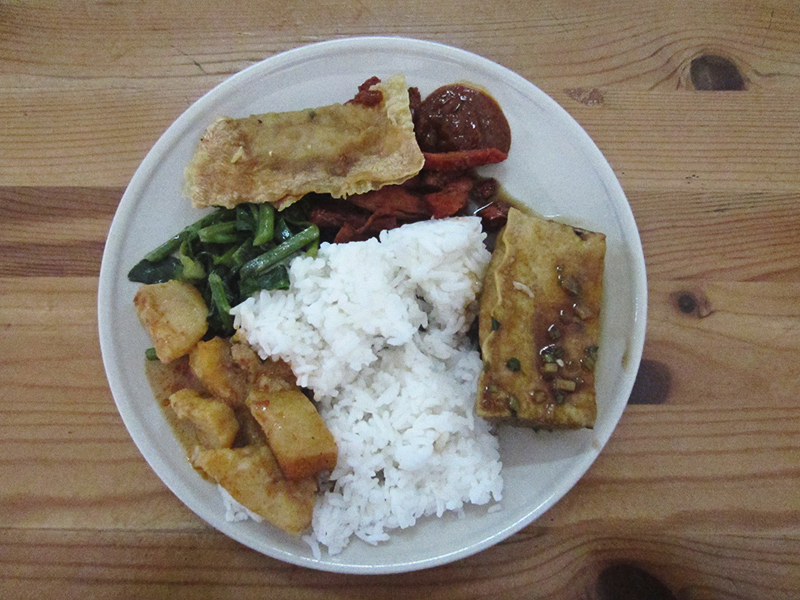 Both were good, the tempeh in the nasi lemak especially so (crunchy and coated in Indian spices), and the rice porridge was wonderfully nourishing – full of veggies, herbs, tofu and sesame oil. Well worth the detour. Vegan chicken rice balls, actually really nice! This restaurant was finally open on our third attempt (they were closed both Saturday and Sunday, although they only advertised being closed on Sunday). 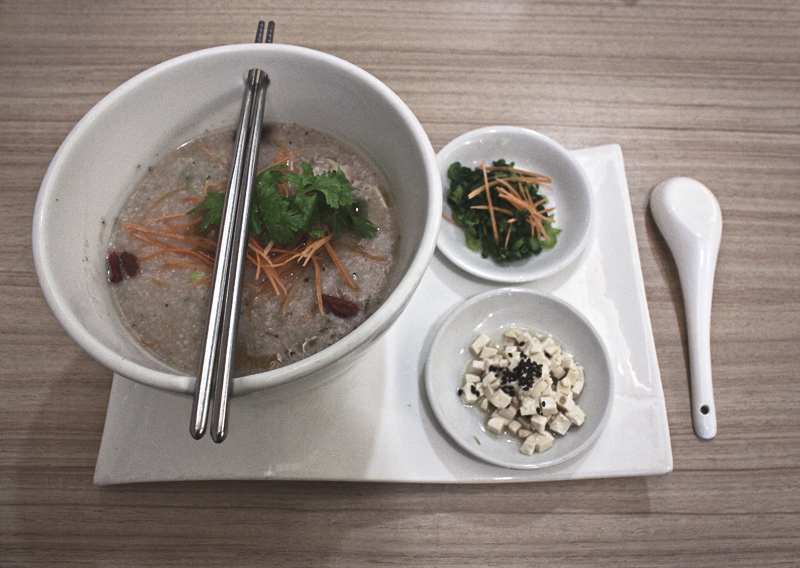 The short menu at Shui Xian Vegetarian showcases vegan versions of popular Malaysian and traditional Malacca dishes. On the recommendation of our friendly waiter, we ordered the vegan chicken rice ball (a Malacca specialty consisting of boiled chicken and dumpling-like rice balls), the laksa – the reason why we came here in the first place (a spicy coconut noodle soup) and the mee rebus (a sweet and sour noodle soup). 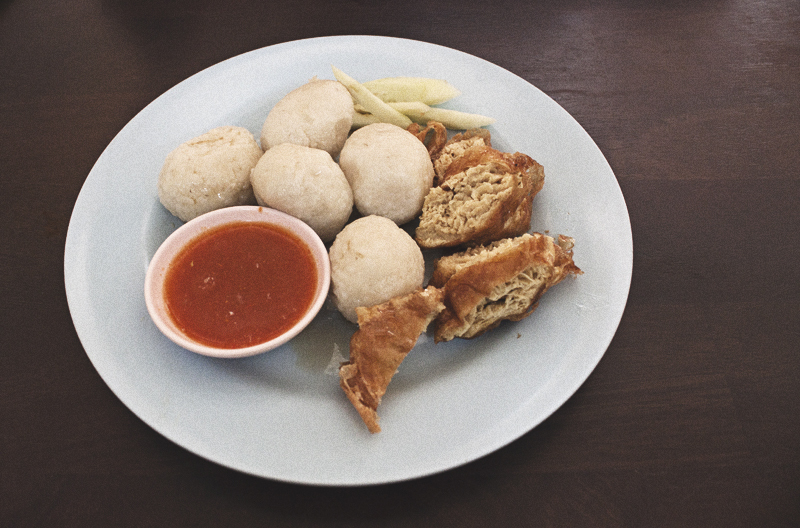 The chicken rice ball were surprisingly nice, albeit cold. The fake chicken was made of tofu and the rice balls were like big doughy dumplings. Both soups used spaghetti instead of Asian noodle which sort of annoyed me, but that’s something that seems to be common all over Malaysia. The laksa unfortunately didn’t contain any laksa herb (daun kesum) but was spicy whereas the mee rebus was almost sickly sweet for my liking (Richard liked it). For the price, you really can’t go wrong though. Clean and bright Chinese restaurant serving a lot – A LOT – of vegetarian and vegan fares. This is one overwhelming menu! We ordered the KFC veggie chicken (we had to! ), deep fried enokitake mushrooms, stir fried sweet potato vine with yellow bean sauce and the stir fried fish with sambal. Nothing is labelled as containing eggs or dairy, but we thought our selection was vegan. Apparently it wasn’t, but our diligent waiter came and asked if we were indeed vegan after we placed our order. That’s a first! So ask before you order. The enoki mushrooms were freaking weird. There was a drizzle of what tasted like the stuff you use to write messages on birthday cakes on it (maybe the original drizzle sauce was our un-vegan selection, resulting in a dodgy substitution?) Everything else was really good! The fish and the chicken were nice and crunchy and possibly the least offensive mock meat I’ve ever had. The chicken tasted a little like what I remember of McNuggets! The delicious greens were the only dish that wasn’t deep fried, so this was very much junk food, but we really enjoyed it for what it was. Another cheap and cheery cafeteria-style Chinese restaurant, this one felt a little more upmarket in the quality of its offering and the general ambiance. I had the claypot spicy mee from the daily special and Richard picked from the self service buffet. Beware that unlike several other vegetarian Chinese eateries, there are eggs and dairy on the menu here, so ask to be sure – very good English is spoken. The food was of superior quality compared to other such establishments. The claypot mee was bursting with flavors and was jam packed with crunchy veggies, ginger, mushrooms and chilies. The buffet was plentiful and fresh. We had a few minty chlorophyll drinks on the side that were also great. Make sure you check out the vegetarian supply shop next door, I bought several vegan tom yam and laksa spice packets to take home for pennies. If there is one restaurant that will be sweet on your wallet in Malacca, this is the one. 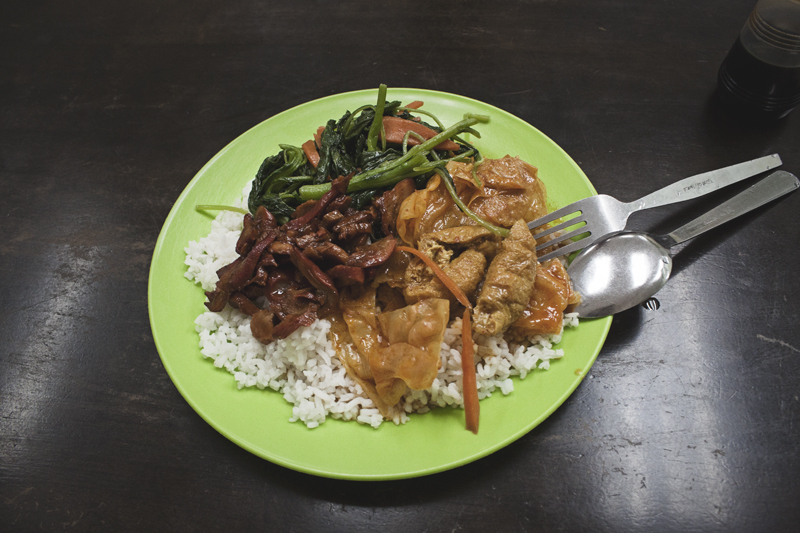 2RM (0,66 USD) will get you a plate of rice with three dishes of your choice from the completely vegan buffet. Come early for optimum freshness as the dishes stay in the glass cabinet all day. They also have noodles from an a la carte menu. The food is adequate – nothing memorable, but it’s plentiful and filling. Most memorable is the price – the cheapest meal we’ve had in nine months of traveling through South East Asia. All this left us craving for a little something sweet, so we headed to the Jonker Walk Market! This entry was posted in Asia, Malaysia, Travel on December 14, 2014 by Amélie. How delicious does longton look? Never tried that before. And veggie chicken?! Never heard of that! Lol 🙂 Chicken rice ball is a Malacca specialty, apparently! It’s always great to see so many Vegan options in different countries. 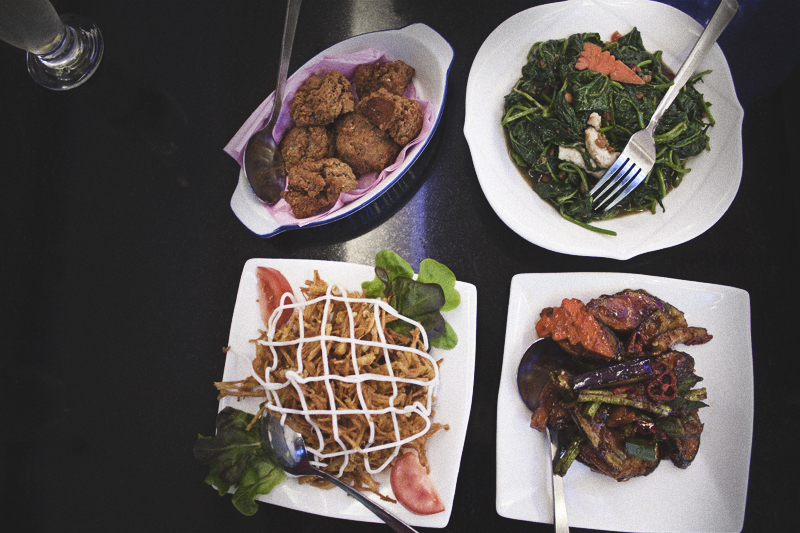 Southeast Asia is definitely one of our favourite and easiest places to eat Vegan. Hey Giselle, thanks for dropping by! I just had a look at your blog, looks awesome! You’re lucky! That sounds awesome, I would have loved to do that! was not that keen on Geographers Cafe TBH but LOVED the veggie Indian Selvam – did you go there?